One of the more common problems I’m asked to evaluate by realtors whenever a home inspector writes his report is a concern about the use of small size wood shims beneath the main beam girders in the crawl space. The main beam girders inside a crawl space are the primary load-bearing elements of a wood floor system. The main beams support the floor joists and these beams span across the interior foundation piers. The floor joists transfer their load to the main beams and the main beams transfer their load to the foundation piers. The load carried by the main beams can be enormous, especially if they underlie an interior load-bearing wall in a two-story home. The beams not only support the weight of the first floor but also that of the second floor. The first phase of any home building project is the construction of the foundation. In a crawl space, there is a perimeter foundation wall that encloses the space and supports the exterior walls of the home, and a series of interior foundation piers that support the main beams. Many times, the interior piers are constructed somewhat haphazardly and the height of the piers are not matched to that of the perimeter foundation walls. Hence, whenever the wood floor structure is constructed, the main beams often need to be elevated above the foundation piers in order to level the floor system. In this case, the builders use what are called “wood shims” to adjust the height of the main beams. If small slivers of wood are used to fine tune the height of the beams, these shims can later “crush” under the weight of the beams once the home is constructed. Whenever a home inspector inspects the crawl space and sees crushed wood shims, he usually cites this as a potential problem and recommends that a foundation specialist be consulted. 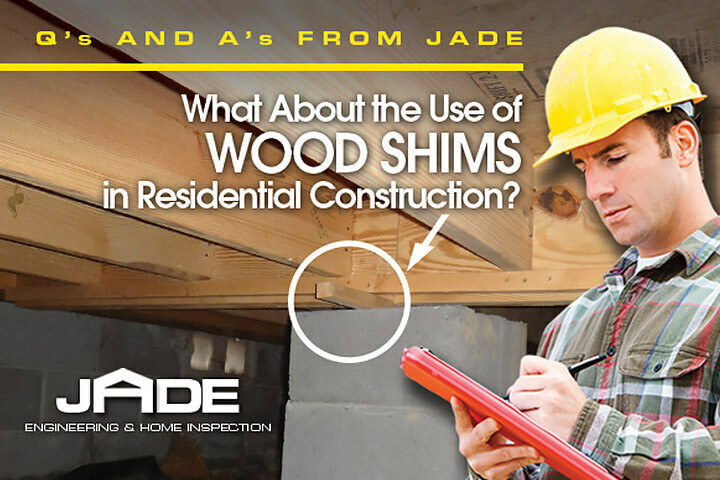 If you call a foundation repair contractor, they will nearly always recommend replacing the wood shims with steel shims. However, this is not necessary. The only problem with using wood shims arises when the shims are too small to support the weight/load of the main beams. If the shims are cut from the edges of nominal 2x4s, they are only 1-1/2 inches wide. A single sliver of 1-1/2 inch wide shim will naturally crush under the weight of nearly any beam in a wood floor system. All that the builders need to do is utilize a series (multiple pieces) of wood shims when leveling the main beams in order to reduce the pressure on the shims. Usually, they just use a single piece of 1-1/2 inch wide shim. These shims can be ¼-inch thick up to 1-1/2 inches thick. Whenever the shim needs to be more than 1-1/2 inches thick, the builder will typically use a piece of dimensional lumber such as a 2×4, 2×6, 2×8 or even 2×10 or 2×12. In these cases, the shims will usually never crush. The crushing problem typically only occurs whenever a single sliver of thin wood is utilized. For the past 31 years, I have been inspecting and evaluating structural problems with residential buildings. In no case have I ever witnessed crushed wood shims that caused any structural or cosmetic problem with a home. This is typically because the amount of “crush” is typically only about 1/8-inch to 3/8-inch. This small amount of deformation will not cause any problems in residential construction. I have never inspected a home that did not have at least one inch of variation in floor level throughout the home. Wood frame structures, like houses, are very flexible and the material finishes utilized, like drywall, are also somewhat flexible and so they can distort small amounts with no consequence (cracking). If I’m asked to evaluate crushed wood shims, I always perform a floor level survey to see what variation in floor level exists. This usually proves that there is no structural concern. This is especially true if there is no cosmetic cracking as a result of the crushed shims. In those cases where a home-buyer insists on a repair, all that needs to be done is to add more wood shims to lessen the pressure on the shims. A typical beam girder is a doubled 2×12, which is three inches wide. The wood shims beneath the beam need to be about three to four inches wide (or more) to lessen the bearing pressure to an acceptable level. The cost for this repair should be nominal. Our sister firm, Durham Design Build, can perform this repair, should you ever need it done. For more information about house problems and solutions to correct them, please contact us today!